Project Foote - malariaresearchhus Webseite! Targeting host molecules with new drugs will prevent the development of drug resistance as the drugs will target molecules whose production is not under the control of the parasite. This is called host directed therapy (HDT) . The ANU groups have identified a number of targets located in the red cells that are potential targets. These have been identified through bioinformatics approaches and through a large-scale ENU mutagenesis screen where mutagenized mice are mated with normal, malaria-susceptible animals and their progeny is infected with malaria. Mice surviving infection have their genomes sequenced and candidate survival genes identified through genome sequencing. This has produced a large number of potential targets. 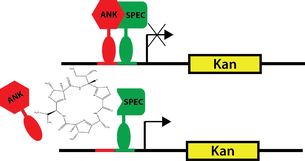 One such target is the interaction between ankyrin and beta-spectrin. If this interaction is interrupted genetically, the red blood cell becomes spherical and is resistant to the growth of malarial parasites . Spectrin forms part of the cytoskeletal network that maintains the biconcave shape of the red cell and ankyrin is the intermediary protein that anchors spectrin to the membrane, through binding to the integral membrane protein, Band 3. This is potentially a target for the development of new antimalarials. However, there is some uncertainty as to whether interrupting this interaction in mature red cells will mimic the genetic lesion, where the interaction is interrupted during the erythocytic progenitor stage and the consequence of this could be a resistance mechanism. Would that be the case than interrupting the spectrin-ankyrin interaction in mature red blood cells will not confer resistance to parasite growth. The groups therefore propose the development of tool inhibitors to test the hypothesis that disrupting of the interaction between these proteins will induce death of malarial parasites.